Rosell (row-SELL) Amado Herrera (her-RARE-uh)...prioritizes God, his family, and baseball in his life, attending church 3-5 times per week...loves playing video games in his leisure time...favorite food is churrasco with rice and beans. Opened season with Triple-A Louisville in Cincinnati's system and hit .267 (24x90) with 13 extra-base hits and 11 RBI in 23 games...Had contract selected on April 26 and made Major League debut with Reds that night vs. Atlanta, grounding out as pinch hitter in eighth inning... First MLB start came on May 1 vs. Milwaukee; singled off Chase Anderson for first career hit...Marked his only start with Reds; was designated for assignment on June 1 and claimed off waivers by Kansas City the following day...Assigned to Triple-A Omaha and his .278 (10x36) with six extrabase hits, five RBI, and four steals in 10 games...Recalled on June 17 and made Royals debut that day vs. Houston, going 0x2 off the bench...Started each of Kansas City's next seven games and recorded an RBI in five of them, batting .310 (9x29)...On June 22 at Houston, robbed Alex Bregman of a homer in eighth inning of a scoreless game, then in top of ninth produced go-ahead RBI triple in a 1-0 win...Marked first go-ahead RBI triple in ninth inning or later in Majors since Mark Teahen in 2007...Posted career-high three hits on four occasions: June 25 vs. Angels, July 3 vs. Cleveland, July 28 at Yankees, and August 16 vs. Toronto...Hit first career homer on July 29 at Yankee Stadium off Daniel Robertson...Reached base safely in 27 of first 33 starts with Royals, batting .282 (35x124) with 14 RBI...Stretch included career-high 11-game on-base streak from July 21-Aug. 1...Followed streak by batting just .135 (15x98) over next 28 games, but rebounded by batting .317 (13x41) over final 14 games of season...Charged with his only error in 175 total chances on Sept. 20 at Detroit, a throwing error at second... With Kansas City, made 28 starts in right field (0 errors in 53 total chances), 16 starts at second base (1/76), 11 starts in center field (0/28), and five starts at third base (0/14)...Stole six bases in eight attempts in the Minors, giving him mark of 136 steals in 193 attempts (70.5 percent) for his Minor League career. In his first stint at Class AAA spent the season at Albuquerque...played LF (70g, 61gs), RF (2g), 3B (5gs) and 2B (3g, 2gs)...also made 5 apps at DH...made his only professional appearance as a pitcher in the 13-10 loss vs El Paso on 6/24 (1ip, 2h, 1er, 0bb, 0k, 1hr)...in the top of the 14th inning of that loss allowed a 3-run HR to Ryan Schimpf that snapped the 7-7 tie...on 11/6 became a minor league free agent...on 11/17 was signed by the Reds to a minor league contract with an invitation to 2018 Major League spring training camp. Played the whole season at High-A Modesto, though was limited to 72 games due to injury...Was selected to play in the Futures Game as the Rockies lone representative...Missed part of April (18 games) and nearly all of May (one game) due to injury...had his best month of the season in June, batting .289 (24-for-83) with five doubles, two home runs, 10 RBI and 14 runs in 21 games...The switch-hitter batted .138 (11-for-80) against left-handed pitchers and .287 (56-for-195) vs. right-handed pitchers...Saw nearly equal playing time at shortstop (40 games) and third base (30 games). Spent the entire season with Single-A Asheville, setting career highs in a number of offensive categories, including games (126), at bats (472), hits (162), doubles (33), home runs (16), RBI (76), walks (61), stolen bases (21), on-base percentage (.419), slugging (.515) and OPS (.933)...His .343 average led the South Atlantic League and was the 2nd-highest among Rockies minor leaguers...Was named the Most Valuable Player of the SAL following the season, along with being named to the All South Atlantic League All-Star Team, SAL Most Outstanding Major League Prospect and a Topps Class A All-Star...Baseball America ranked him as the 3rd prospect in the Rockies organization and he was also labeled as the Best Athlete by the same publication...MLB.com rated him as the 99th top minor league prospect following the season. Played in 110 games between Low-A Asheville and Short Season Tri-City...began the season with the Asheville Tourists as a 19-year-old and hit .202 (43-for-213) with 8 doubles, 2 triples, 1 home run and 26 RBI in 63 games...was sent to Short-Season Tri-City and hit .284 (55-for-194) with 30 RBI for the Dust Devils. Was the primary shortstop for the Rookie Level Casper Ghosts...played in third-most games among all Ghosts and had the second-most at-bats...his eight triples on the season were tied third-most in the Pioneer League...was named PL Player of the Week for 6/27-7/3...was rated by Baseball America as the fifth-best prospect in the Pioneer League. Spent his first professional season with the Rockies DSL club as the primary shortstop...played in the most games, and had the most hits, doubles, RBI and the second-most stolen bases among all Rockies...named a DSL Mid-Season All-Star...named by Baseball America as the 12th-best prospect in the Rockies system. January 2, 2019 Miami Marlins claimed RF Rosell Herrera off waivers from Kansas City Royals. December 18, 2018 Kansas City Royals designated RF Rosell Herrera for assignment. 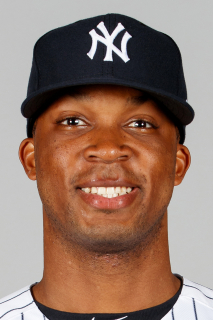 October 22, 2018 OF Rosell Herrera assigned to Gigantes del Cibao. July 16, 2018 Kansas City Royals activated RF Rosell Herrera from the paternity list. July 13, 2018 Kansas City Royals placed 2B Rosell Herrera on the paternity list. June 17, 2018 Kansas City Royals recalled 2B Rosell Herrera from Omaha Storm Chasers. June 5, 2018 Omaha Storm Chasers activated 2B Rosell Herrera. June 2, 2018 Kansas City Royals claimed 2B Rosell Herrera off waivers from Cincinnati Reds. June 2, 2018 2B Rosell Herrera assigned to Omaha Storm Chasers. June 1, 2018 Cincinnati Reds designated 2B Rosell Herrera for assignment. May 22, 2018 Cincinnati Reds optioned 2B Rosell Herrera to Louisville Bats. April 26, 2018 Cincinnati Reds selected the contract of Rosell Herrera from Louisville Bats. January 22, 2018 SS Rosell Herrera assigned to Louisville Bats. November 17, 2017 Cincinnati Reds signed free agent LF Rosell Herrera to a minor league contract and invited him to spring training. November 6, 2017 LF Rosell Herrera elected free agency. September 1, 2017 Albuquerque Isotopes activated LF Rosell Herrera from the temporarily inactive list. August 28, 2017 Albuquerque Isotopes placed LF Rosell Herrera on the temporarily inactive list. July 29, 2017 Albuquerque Isotopes activated LF Rosell Herrera from the 7-day disabled list. July 19, 2017 Albuquerque Isotopes placed OF Rosell Herrera on the 7-day disabled list. April 30, 2017 OF Rosell Herrera assigned to Albuquerque Isotopes from Grand Junction Rockies. April 27, 2017 OF Rosell Herrera assigned to Grand Junction Rockies from Albuquerque Isotopes. February 2, 2017 Colorado Rockies invited non-roster OF Rosell Herrera to spring training. November 9, 2016 OF Rosell Herrera assigned to Albuquerque Isotopes. November 8, 2016 Colorado Rockies signed free agent SS Rosell Herrera to a minor league contract. November 7, 2016 LF Rosell Herrera elected free agency. October 20, 2016 OF Rosell Herrera assigned to Gigantes del Cibao. April 6, 2016 LF Rosell Herrera assigned to Hartford Yard Goats. March 29, 2016 CF Rosell Herrera assigned to Colorado Rockies. February 11, 2016 CF Rosell Herrera assigned to Albuquerque Isotopes. December 3, 2015 Colorado Rockies signed free agent CF Rosell Herrera to a minor league contract and invited him to spring training. December 2, 2015 CF Rosell Herrera elected free agency. October 5, 2015 Colorado Rockies recalled CF Rosell Herrera from Modesto Nuts. April 4, 2015 CF Rosell Herrera assigned to Modesto Nuts from New Britain Rock Cats. March 14, 2015 Colorado Rockies optioned SS Rosell Herrera to New Britain Rock Cats. September 29, 2014 Colorado Rockies recalled Rosell Herrera from Modesto Nuts. September 27, 2014 Modesto Nuts activated SS Rosell Herrera from the 7-day disabled list. August 15, 2014 Modesto Nuts placed SS Rosell Herrera on the 7-day disabled list. May 31, 2014 Modesto Nuts activated SS Rosell Herrera from the 7-day disabled list. April 24, 2014 Modesto Nuts placed SS Rosell Herrera on the 7-day disabled list. March 12, 2014 Colorado Rockies optioned SS Rosell Herrera to Modesto Nuts. November 20, 2013 Colorado Rockies selected the contract of Rosell Herrera from Asheville Tourists. March 30, 2013 Rosell Herrera assigned to Asheville Tourists from Tri-City Dust Devils. July 7, 2012 Rosell Herrera assigned to Tri-City Dust Devils from Asheville Tourists. May 20, 2011 SS Rosell Herrera assigned to Casper Ghosts from DSL Rockies. May 29, 2010 DSL Rockies signed free agent Rosell Herrera.